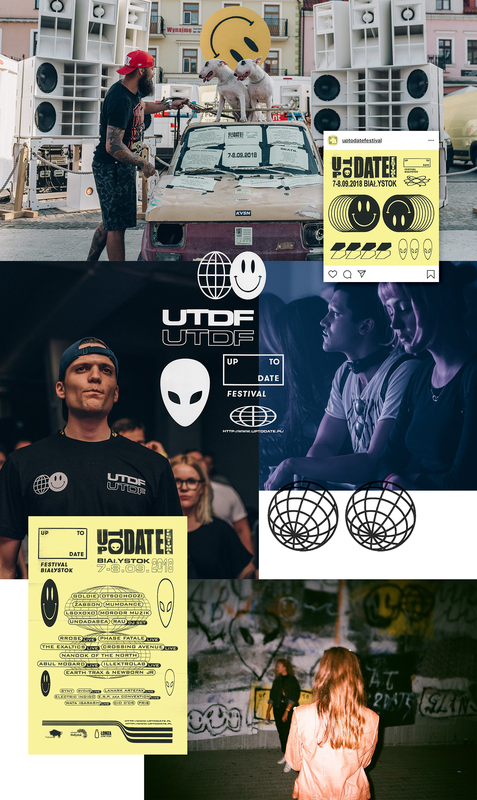 Up to Date is an award-winning electronic and hip-hop music festival. The concerts have been organized in Białystok since 2010. 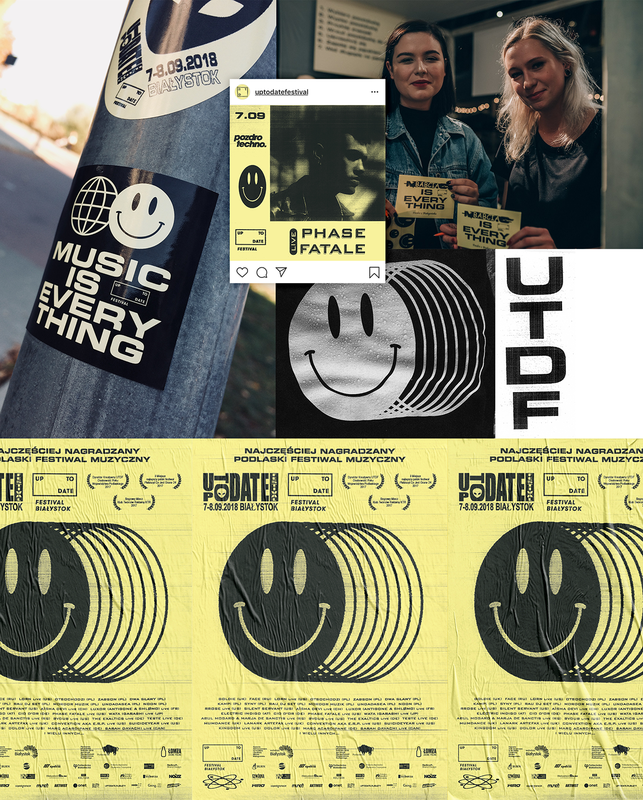 The event is addressed to a wide audience bringing together young and old, and the Pozdro Techno Sound System original project aims to break stereotypes related to techno music. 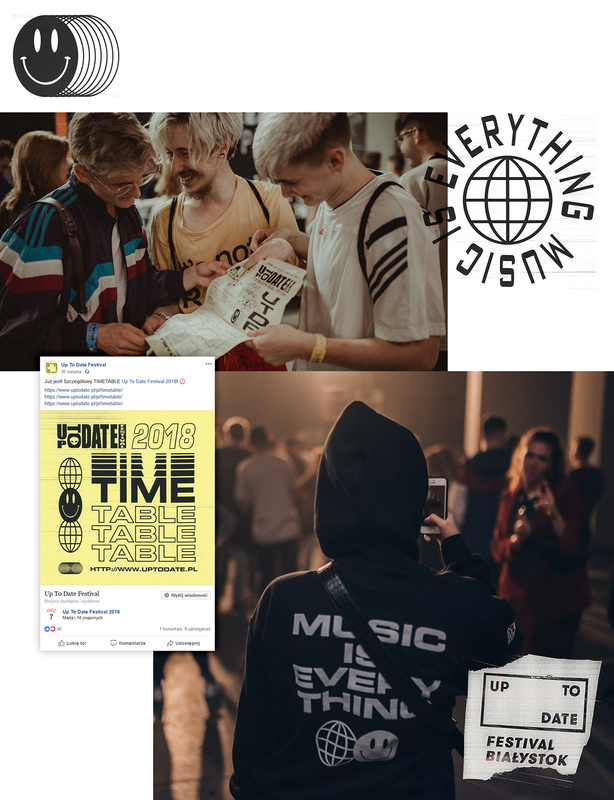 Since the beginning, the event's creators have built a visual identity with a strong handmade motif - choosing a more difficult but also more personal method of brand's communication with the participants of the event. 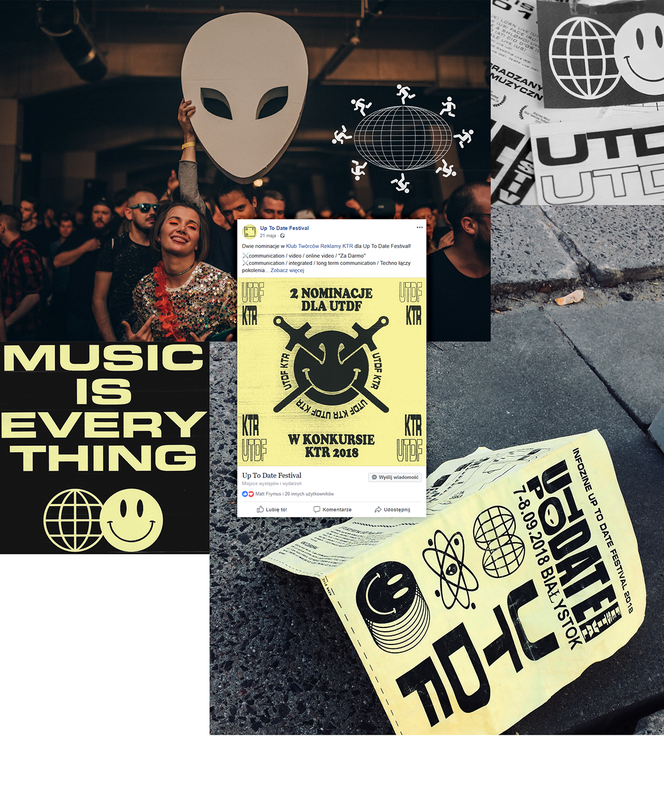 To prepare the 2018 branding, organizers chose Redkroft, and the main theme was the cultural niche of the 90s: rave zines, techno parties and hand-made promotional materials from photocopies and cut-outs. The yellow background symbolizes the colour of photocopying paper. The pictograms of aliens, Smiley, Earth globes, chessboards and other elements strongly refer to the 90s. There are also some dirty traces of photocopying, glued and torn elements, imperfect clarity of photographs. Typography also builds the atmosphere of those times, such as the sloppy letter "ł" from the "missing font". In terms of production, the whole thing was a huge organizational and design challenge. Most of the materials were repeatedly printed, photocopied and scanned. The sum of produced files was well over 2000, taking up more space than all our projects from the last three years combined. The number of prints exceeded 1500 copies, and the sheets of paper we used could be arranged in a length of 2.5 kilometres. As the whole project had a dominant handmade character, the smallest change in one element often resulted in starting the whole design process from scratch. The nature of the event and ever-changing organizational circumstances resulted in hundreds of changes and corrections. The feeling of fulfilment after the festival was followed by ovation and champagne. We love this project so much that we just can't wait for the next edition! 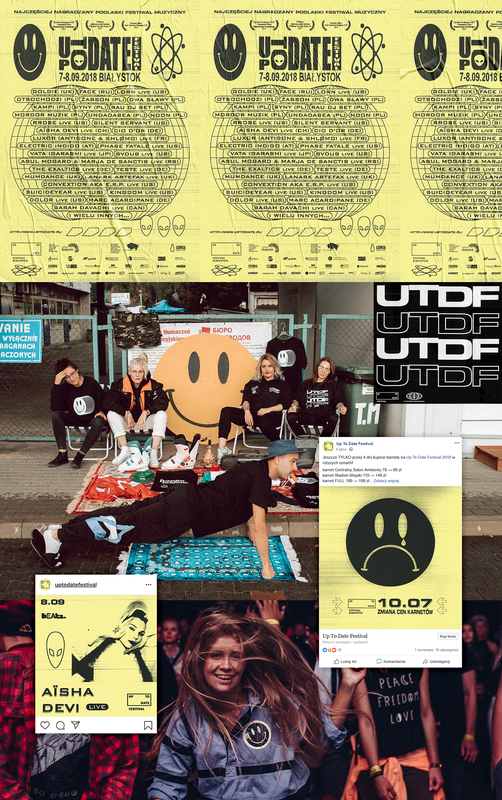 Klient: UTDF 2018 Projekt: Branding Up to Date to obsypywany nagrodami festiwal muzyki elektronicznej i hip-hopowej. Koncerty organizowane są w Białymstoku od 2010 roku. Wydarzenie adresowane jest do szerokiego spektrum odbiorców integrując pokolenia, a autorskie przedsięwzięcie Pozdro Techno Sound System ma na celu łamanie stereotypów związanych z muzyką techno. Twórcy imprezy od początku budowali identyfikację wizualną o silnym charakterze handmade - wybierając trudniejszą, ale też bardziej osobistą metodę komunikacji marki z uczestnikami wydarzenia. Do przygotowania brandingu edycji 2018 organizatorzy festiwalu wybrali Redkroft, a motywem przewodnim stała się kulturowa nisza lat 90-tych: rave’owe ziny, imprezy techno i ręcznie przygotowywane materiały promocyjne z ksero i wycinanek.